My time in the Dolomites was nearly over. I’d hiked the most well-known trails and photographed the range’s most famous peaks and valleys. The muscles in my legs ached from almost daily climbs, but I was content and deeply satisfied with all that I had seen and done. August 2018, single shot, additional exposures for highlights, focal length 70 mm, aperture f/11, shutter speed 0.8 second, ISO 64, tripod. On my last day, I again ventured into Tre Cime Natural Park. It’s one of the loveliest places in the Dolomites, and I wanted to see it once more before I packed up to fly back home. 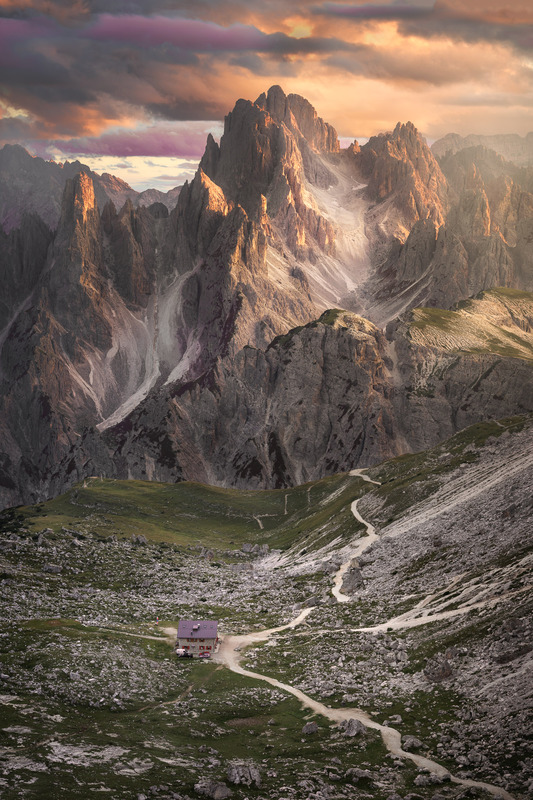 It was nearly sunset by the time I reached my destination, a rocky ledge overlooking the Refugio Lavaredo, a lodge near the base of the Tre Cimes. From that vantage point, looking down a rocky ledge toward the imposing peaks in the distance, the refugio appeared tiny and insignificant, a diminutive bulwark against nature. Though it seemed very far away, I could see lights in the windows of the refugio, and I knew that for a few hours, it would be a home to someone, a place of welcome amid the harsh, rocky terrain of the mountains. It struck me then, looking at the savagely beautiful peaks of the Dolomites, that sometimes this is all we need in life: a small refuge, a place of comfort, in what is sometimes a savage and unforgiving world.